Washington, D.C. mayoral candidates Vincent Gray, left, and Adrien Fenty look over their notes prior to their debate at the Sixth and I Historic Synagogue on Tuesday night. The debate was moderated by ABC-7/WJLA-TV reporter Scott Thuman, far left. 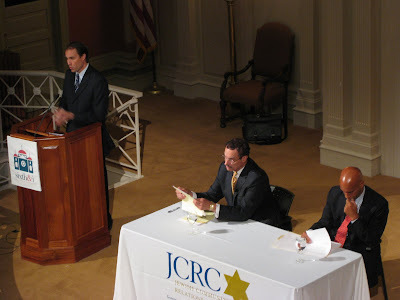 Washington, D.C. Mayor Adrien Fenty and his opponent, Council Chairman Vincent Gray, participated in a debate at the Sixth and I Historic Synagogue in Chinatown Tuesday night and the first question asked of the two candidates was regarding environmental initiatives in the District of Columbia. Here is video I took of both of their responses. If you are a registered D.C. voter this hopefully will help you make a decision about who you want leading our Nation's Capital towards becoming a greener, more bike friendly and public transit oriented city with streetcars humming along once decaying but now vibrant neighborhoods. You decide.